varies depending upon the symptoms, duration of symptoms, associated pathologies, and response to prior treatment. If the symptoms have been present only a short time, the treatment would more likely be palliative, counselling about diet, or maybe a soft splint. On the other hand, if the symptoms have been ongoing for years, with lots of joint noise, with lots of associated medical pathologies,it will likely need permanent repositioning of the jaw (comprehensive treatment). TMJ treatment is usually discussed as “phases”: phase I being devoted to finding a therapeutic position for the lower jaw, and phase II being devoted to stabilize the lower jaw in the therapeutic position. 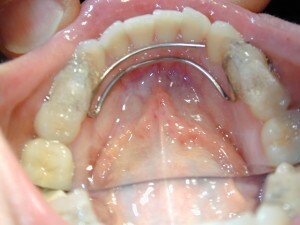 Phase III is retention- typically a night appliance to maintain the jaw repositioning. 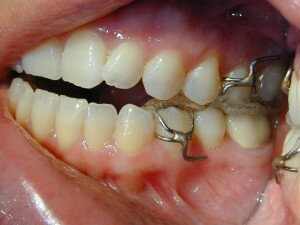 One of the mistakes most often made by dentist treating TMJ is that the appliance is not adequate. Forty per cent of my patients need a different night appliance to keep them comfortable because when they go unconscious, they loose muscle tone and their jaw displaces, so a night appliance is made which controls jaw position even if asleep. Far too often, daytime appliances are made too bulky to be tolerated with work requirements (i.e. can’t talk with appliance in). In my office we often use very small metal frameworks to carry the acrylic so as to be minimally intrusive (crozat frameworks).